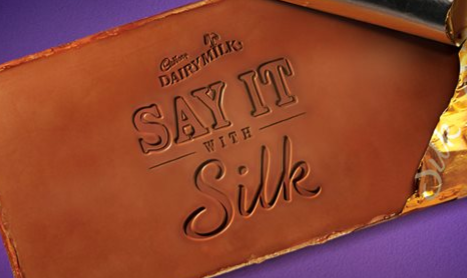 Launched in January 2010 as a premium addition to Cadbury chocolates with a creamier, smoother and silkier proposition, Cadbury Dairy Milk Silk has launched a new campaign that urges you to ‘Say it with Silk’. Calling all Silk buffs – also affectionately referred to as ‘Silkaholics’ – the chocolate brand has thrown up a mystery around a new machine, which it says will soon come to a store near you and help you say it with Silk. Yes, you can actually select a message and have it etched on a bar of Silk for that special someone! Though the customized Silks are available only at Magnet hypermarket in Mumbai for now, the brand says that more stores would have it soon. For ‘Say it with Silk’, the brand had chosen social media platforms to create the excitement and buzz, prior to revealing the new feature. Fans had been invited to guess what this new machine will do to help unveil the mystery. In fact, it was the trend #SilkMystery on Twitter that caught my attention last week. Just days after sharing a social experiment to see the ‘Silk Effect’ produced by a Silkaholic in an elevator, the Facebook wall began its Silk mystery journey. A cover page that claimed, “It’s not a bird. It’s not a plane. It is something we have never seen before’ was soon accompanied by a picture update of a strange machine found by a bunch of Silkaholics. Post by Cadbury Dairy Milk SILK – Have you felt Silk lately? Soon visual updates followed comparing the strange machine with Alexander Graham Bell’s lost invention, the telegraph and was even suspected to be from outer space. Another similar machine was found again, while the fans’ guesswork continued. An innovative fan’s guess also included ‘Bamboocopter from Doraemon’! The campaign was also extended onto Twitter. Users were asked to tweet with #SilkMystery and share their ideas on the machine, to help unveil what the new machine was all about. The cover photo featuring the machine was revealed bit by bit triggered by tweets from the followers via an API. For two days, Twitter users tweeted continuously to see what’s behind the cover. Finally on the 1st of September, a visual of the machine adorned the cover photo, after being unveiled a little bit every day. The visual was accompanied by a message that the machine is coming soon to a store near you, so you can say it with Silk. A few days later, the wall shared a picture of a Silk bar etched with ‘Have an Awesome Birthday!” As you can see, the post has received more than 25K likes and has been shared more than 1000 times. After the simultaneous updates on Twitter with the eventual reveal, the handle began a contest with gift hampers to be won. Twitter users were invited to tweet funny and witty messages to their best friends using the hashtag #SayItWithSilk. ‘Say it with Silk’ has made good use of social media platforms to introduce the new feature, especially when it has 2.8 million fans on Facebook and more than 6K followers on Twitter. The use of Facebook for the visual storytelling bit and Twitter for getting people to gossip, is creative and clever. You can say it with Silk only today and tomorrow and that too only at Matunga in Mumbai, however, until the Silk machine is available at a store near you, you could buy the regular Silk and say it with a greeting card! What are your thoughts on ‘Say it with Silk’ campaign? Did you like the #SilkMystery created around it? Do let us know in the comments.